Tweet Continuing the series of tutorials from Brenna's Pancake's and Pajamas 2nd Birthday Party, is the banner tutorial. I originally saw these types of crafty banners on Etsy and I almost purchased one for $38 before I smartened up and thought I could make these myself with stuff I already had. I love the idea of these banners because you can reuse them every year. Here's another banner I made for my friend's wedding. 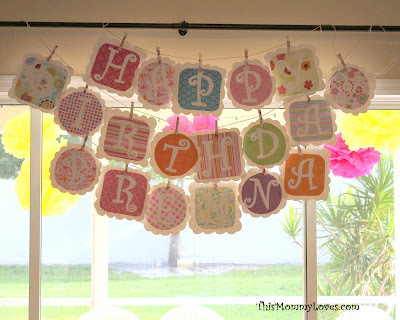 These banners are very easy to make with just a few basic supplies. Basic Scrapbooking Paper. Whatever color scheme you like. 1) Cut a combination of scalloped-edge squares (8.5" x 8.5") and circles (8.5" diameter) out of your white card stock. 2) Cut your scrapbooking paper in squares and circles to fit within your scalloped-edge card stock shapes. 3) Print out letters in whatever font you prefer also on white cardstock. I always tend to use CURLZ font. The secret is to print them inverted so that you can cut slightly around the edges and the print lines will not show on the front side. 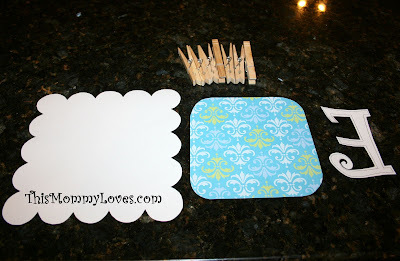 4) Now just glue your scrapbooking paper shape onto your cardstock cloud backer and then glue your cut-out letters onto the scrapbooking paper. 5) String the letters of your banner together using clothespins on craft twine. Now, just because I love you, and I don't want you spending all day trying to cut the perfect scalloped-edges on your cardstock paper and cursing at your computer to invert those stupid letters, here's a FREE Printable for the scalloped cloud backers, the Happy Birthday Letters, and the Welcome Letters. Just click menu on the slides below and then follow the link to the google document. Then all you have to do is download the presentation as a powerpoint or as a pdf and print. :-) Let me know if you have any problems. What are some of your "I can make that myself projects?" I'd love for you to share. This project is shared at the following link parties. Thank you so much to the ladies who have featured this post! This looks like something even I could make. Wow, just saw this on TT&J and couldn't believe my eyes. My daughter's name is Brenna! We don't see it very often. I definitely will print up this banner because her bday is in 3 wks! THANKS. BTW, my Brenna is almost 15! That is just SO cute!! You are so awesome for sharing this! My daughters 1st birthday is Saturday and I haven't been able to find anything I like in the stores. Now it will be perfect. Thank you!! These are so cute. Thanks for sharing. I found your link from Its So Very Cheri. What a great idea! Thanks for sharing. I'm your newest follower. Thanks so much for linking up to SS! I sure hope to see you in the future! I have been waiting for this tutorial! After I saw the photos from Brenna's birthday I have been DYING to know how to do this! Thank you for sharing! Love the banner and thanks for the freebie! Thank you for joining us this week for Anything Related! WAY cute!! Love them. Is it ok to make myself a Happy Birthday one since its this week? haha. what a great idea!! Lovin' your blog. Newest follower! If you have any idea what I'm doing wrong, your help would be much appreciated! Thank you so much for sharing! Just made my banner for my baby girl's first birthday and I must say it looks amazing! Her poor brother will look back at pictures from his first birthday and see the "Party City special" and then look at his sister's and think she's the favorite. I'll have to make another for his birthday this year too! Will post pictures after her party in April. Also, just made a tissue paper pom pom to see how it looks and they are awesome! I can't wait for her party. Thank you!!! I am having trouble printing these in the 8.5 x 8.5 format too. Anyone have any pointers? I am so excited to make these for my little ones bday party. AHHHH!! Thank you for helping with this!!! I have seen them online too and ALMOST sprung for the expensive little devils! You are a genius! Thanks!!!!!!! Had the same problem with the size when downloaded the tutorial, don't know how to fix it, however, I copied and pasted the image on word and adjusted the size and it worked. It might be a little time consuming when adjusting images one by one, but if you want the banner to look perfect its worth it. How do you print the letters "inverted"? Also- I don't see anything to click on to download the scalloped edge pattern. I'd love to make this banner for my triplets' 2nd bday coming up. Now I see - it must have taken awhile to upload... BUT not sure how to save it so I can print it. Here's hoping I figure it out! Super Cute! I am unable to access the cloud backer cutout template. I figured out how to invert the letters myself but I could really use the cardstock cloud template. Thanks for your help!! nevermind, as soon as I published the comment the webpage refreshed and showed me the links! Thanks for sharing!! Thanks for the templates! I have a lot less stress now that I can start working on my daughter's banner! I'm not sure if it is my browser but the printable banners won't show. I would love to print the birthday banner. Any ideas? Thank you for posting this, it is so cute! Having trouble with the size, it stretches to 8.5 x 11 instead of 8.5x8.5. Any suggestions?